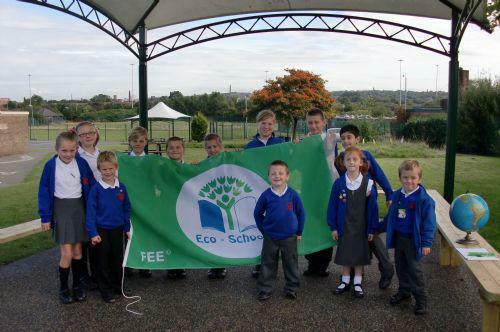 Welcome to the Eco Group page! Latest News - We have been awarded our third Green Flag! Well done to the Eco Group and everyone in school who helps to make us eco-friendly! 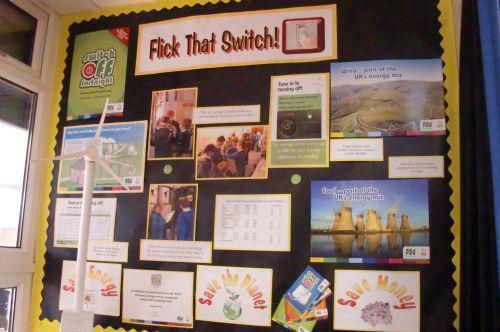 In November the Eco Group asked everyone to "FLICK THAT SWITCH" during this year's Switch Off Fortnight campaign. 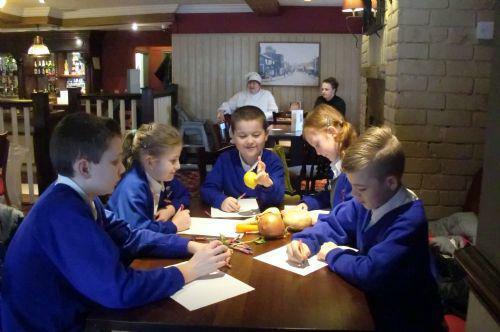 At their meeting on 14th November, the Eco Group found out how electricity is made and how it gets to our houses and schools. We also realised the importance of saving energy and using more eco friendly ways of making electricity. Hannah and Keiran from the Eco Group have been taking the meter readings every morning to see how much electricity we save during the fortnight. Other group members are checking to see who is switching off and giving out stickers to remind everyone. As part of our action to raise awareness of global perspective we have decided to nominate Eco Heroes throughout this year and their names will be displayed on the Eco noticeboard. Our first Eco Hero is Mr Wellock for keeping our school virtually litter free. Well done Mr Wellock! 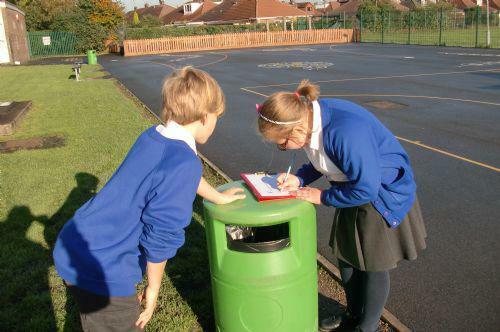 On 24th October we did a litter audit of the school grounds after break and found that the grounds are virtually litter free. At our meeting on 11th October, we answered questions as part of our environmental review. From this we decided what we needed to do this year and we made an Action Plan. 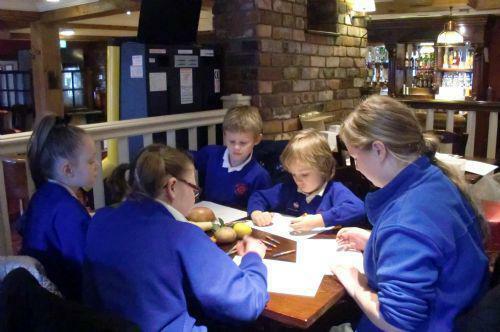 Children were asked to apply for a place in the Eco Group. 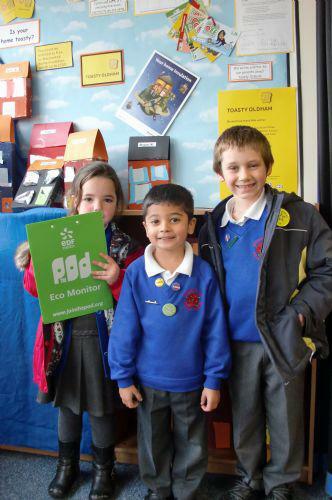 There were lots of good applications which showed that the eco message is being passed on throughout the school. 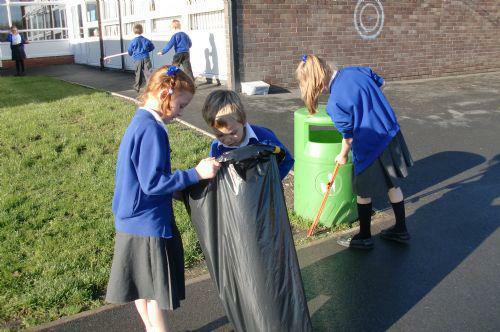 We work on the Eco Schools topics - Water, Biodiversity, Energy, Global Perspectives, Healthy Living, Litter, School Grounds, Transport and Waste. Each year we complete an Environmental Review and an Action Plan for the topics we are looking at. Being an Eco School involves everyone and through our topic based curriculum, all classes learn about things linked to eco topics, e.g. Year 6 The Ice Age, Year 5 Keen to be Green, Y4 Fair Trade, Y1 Bugs etc. 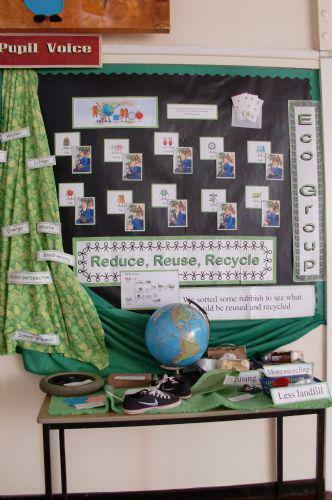 Our Eco notice board in school tells everyone about what we are up to. We also have a display book in the Front Entrance, call in and have a look! 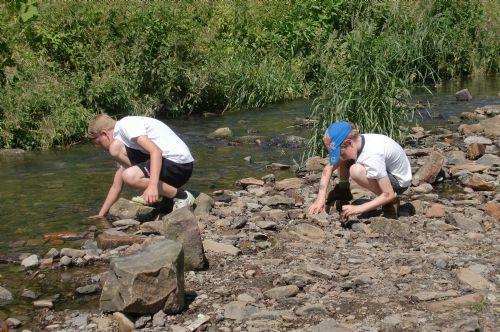 Our last topic this year was HABITATS and we visited the Park Bridge Heritage centre on a very warm day in July. 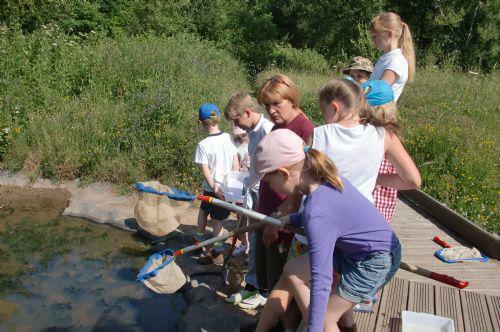 We did some pond dipping, caught some bugs to have a closer look at them and discussed where they liked to live and why. 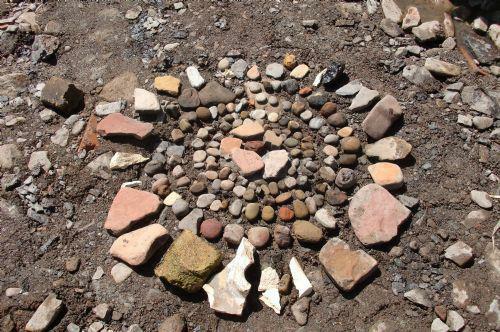 Later we learned how to make paint from stones and made a natural collage by the river. We looked at TRANSPORT during the first Summer half term. 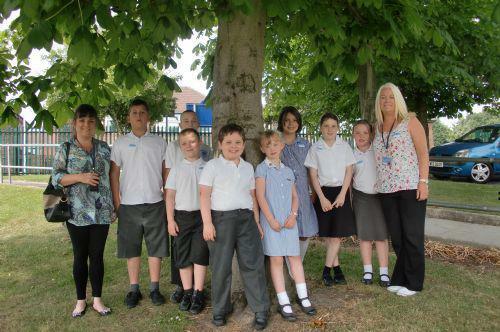 We did a survey to find out how children got to school and the whole school took part in Walk to School week, starting on 20th May 2013. 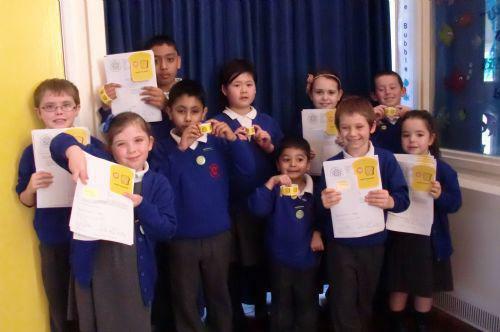 We were worried about the safety of Butterworth Lane and Councillor Shuttleworth agreed to award prizes for a road safety poster competition, aimed at car drivers. The prizes were presented in Assembly. Aswell as being Eco Group members, in January 2013 they became WWF Green Ambassadors, and decided each one could be linked to one of the WWF Green Team. The children investigated WASTE during the Spring term. They found out about what we throw away and what happens to it. Year 5 visited a landfill site in Bury so Faye was able to tell us all about it. During Waste week we filled in survey sheets to show what we threw away at home and what we recycled. 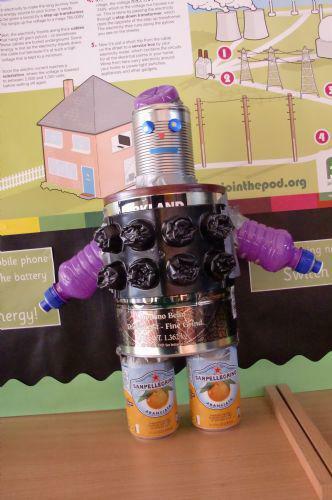 Dylan made a robot out of rubbish which can be seen next to our noticeboard. Our first topic was ENERGY. The members of the Eco Group were asked to find out why it is important to save electricity. Kadi and Teighan did lots of research and made a booklet to show everyone. They were given the Headteacher's Award for enthusiasm and commitment to the Eco Group, well done! 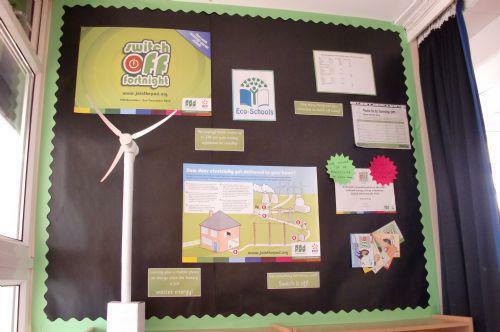 We took part in Switch Off Fortnight 19th-30th November.The Eco Group launched this during Assembly. They monitored who was switching off during the fortnight and handed out stickers.They checked the meter readings to see how much electricity we saved. WE SAVED 13% IN WEEK ONE AND 18% IN WEEK TWO - WELL DONE EVERYONE! July 2012 - We Did it! 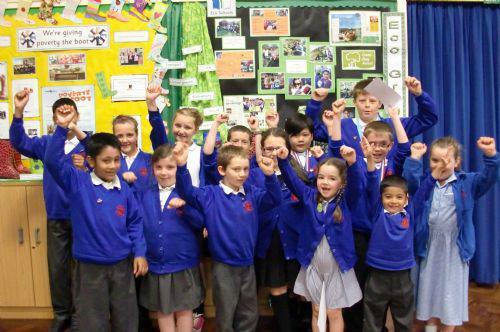 Whitegate End have been awarded their second Green Flag Award - well done everyone - keep up the good work! We started this topic by thinking about water and where we get it from. We looked at some slides about a school in Ghana who get all their water from a pump outside! These can be found on the Water Aid website. We then filled in charts to see how many times we use water in a week. Mrs Ryan, Mrs Smith and Mrs Ashton have helped us to create a fantastic water display. Have a look when you visit - it's hard to miss! In Spring 2012 we became Rainforest Rescuers!! We learned about the rainforests and what we can do to help save them. We took part in the Sky Rainforest Challenge and chose "the stuff we buy" option for our project. We watched a film about the rainforest and asked questions at school and at home about what paper we buy and how we use it, and if we know what paper symbols mean. We will look at ways to reduce our paper use. Look out for our rainforest display when you are visiting! 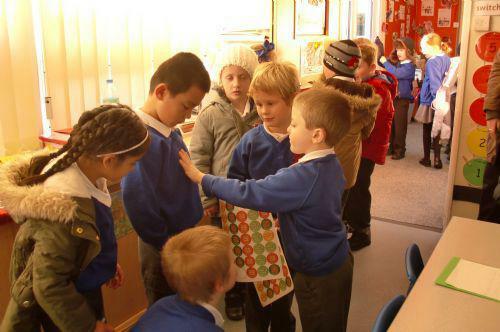 In Autumn 2011 we learned about energy. Once again we took part in SWITCH OFF FORTNIGHT, 21st November - 2nd December. Results - WE SAVED 7% OF DAY TIME AND 8% OF NIGHT TIME ELECTRICITY! WELL DONE EVERYONE - KEEP ON SWITCHING OFF! 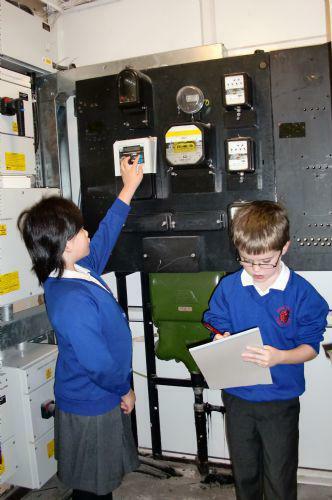 Callum and Katie read the meters every day to see how much electricity we used. We checked up on who was switching off! We are also promoting the TOASTY OLDHAM campaign. We have sent a letter to our parents telling them all about it. 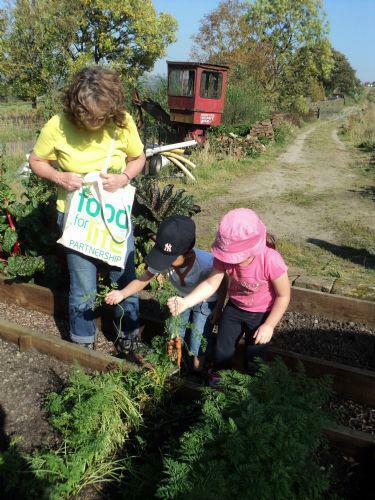 In 2011/12 our first two topics were linked, "Healthy Living" and "Global Perspective" - we visited Cronkshaw Fold Farm on 30th September to learn about where our food comes from. Joy, the farmer, visited the school on Friday 7th October for our harvest with a difference!. As part of the "Global Perspective" topic, the school held a Welly Day to support Farm Africa. The children and staff wore wellies to school and donated £1 to Farm Africa, we held welly design and welly wanging competitions, and sold welly biscuits. We raised £291.50! Our first topic was litter. 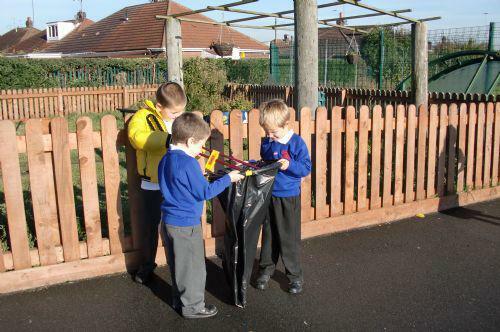 We did a litter pick and audit of the school grounds. We chose the slogan "Stop the Drop" and told everyone about this in Assembly. 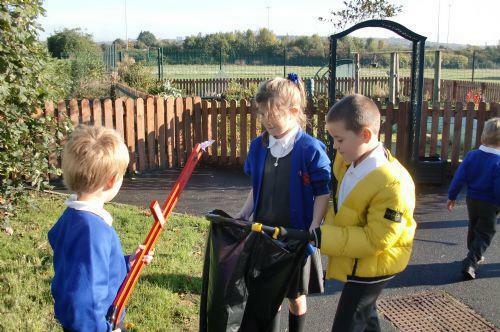 Message from the Eco Team - Please do not drop litter - if you see someone dropping litter ask them to put it in the bin! 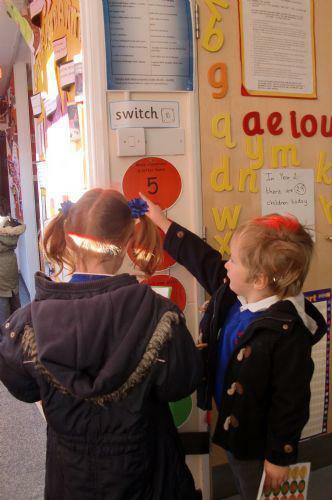 In November we took part in Switch Off Fortnight. We asked all our friend and families to switch off at home as well. 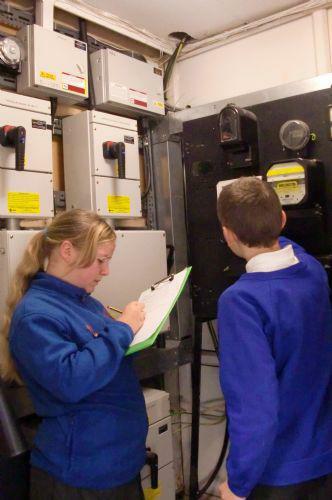 In school we chceked the meter readings and we save 10% of day time and 40% of night time electricity. Message from the Eco Team - Keep on switching off! Many groups from the school have visited Waste Works - the Co-operative's recycling centre in Manchester. 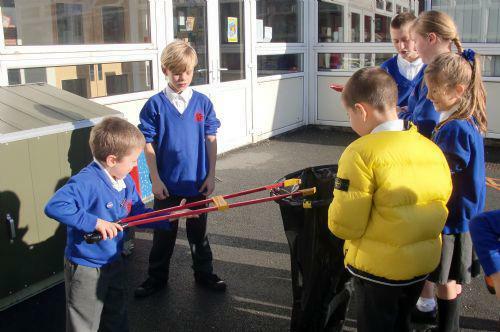 In December the Eco Team visted to learn about waste. We took some paper to be processed in the huge recycling machine and learned how to make our own paper. We told everyone in school about the three "R"s - REDUCE, REUSE AND RECYCLE!. Mr Fay came from Oldham Council to show us which bins to use for different types of rubbish. In school we recycle paper, card, plastic bottles, tins and food, now we are part of the Food Loop. Message from the Eco Team - Remember the three "R"s! March was Bug Month. We used lots of recycled materials such as pallets, bricks, old carpets and pipes to make our bug hotel. Various groups in school have been outside to keep an eye on residents. 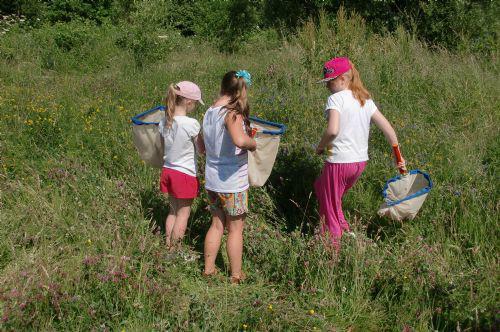 Message from the Eco Team - Little bugs do big things in the World! Our final topic this year was Transport. We asked everyone how they got to school. We were amazed that only 46% of pupils walked to school. We decided to have a Walk to School Day on 13th July. Miss Ashton did a whole school Assembly to tell everyone about why we should walk to school and on the day 77% of pupils walked! Message from the Eco Team - please walk when you can!